Making your event feel extra-special is easy; all it really takes is a few personal touches to make your celebration stand out. That's why these personalized coasters from Weddingstar are such a popular option for event décor. 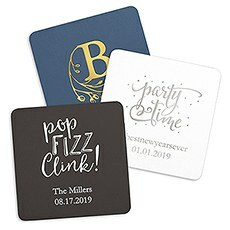 Whether you're hosting a birthday party, planning a wedding or throwing a baby shower, you'll be thrilled with our selection of stylish custom coasters. 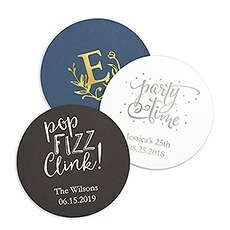 Plus, the affordable prices ensure that these fun accents fit right into your budget for the event.Countless CustomizationsChoose these custom coasters if you want your event décor to match. With multiple color options, you can easily find a good fit for your chosen design. And the customizations don't end there. You can also choose the imprint foil color and select from a wide variety of monogram styles, logos and formats for your design. That makes it so easy to keep everything throughout your event looking consistent, chic and stylish. 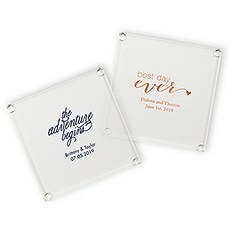 We also offer multiple coaster shapes so you can pick the one you like best.Great for All OccasionsWhile we're best known for our personalized favors for weddings at Weddingstar, these coasters are a great fit for all kinds of events. In addition to custom wedding coasters, you can find something for any type of celebration, including engagement parties, bridal showers, baby showers, birthdays, anniversaries and more. Choose a fun phrase or logo that fits in with your event to get something special for your guests to enjoy. In addition to using them as practical places to set down their drink, many guests may want to bring home a coaster or two as a personalized gift from such a memorable occasion. Click on any of our personalized coasters to see all the customization options and to start building yours from scratch for a completely unique design.